Non-stick coatings were initially developed to make the pans more durable and easier to clean. While the non-stick properties do help with release, they are not intended strictly for that use. All non-stick coatings still require the use of some type of release spray, oil or flour. Here are some simple tips to ensure you get the best possible performance and longevity from your Bundt pan. Before initial use, wash the pan in hot soapy water and rinse clean. Pre-season the pan by coating interior with a liquid or solid vegetable oil (without the ingredient lecithin if possible) and bake empty (no batter) in a 200 °F (93° C) oven for about 15-20 minutes. Allow pan to cool and wipe excess oil from pan. Before each subsequent use, apply release spray, oil and/or flour to the interior of the pan. Wipe clean after each use with cloth or nylon brush (no metal scrubbers), or wash as needed with hot water (using soap sparingly). Do not use metal utensils to remove products from pans. Avoid using harsh chemicals and detergents, as they will remove the seasoning from the pans. If re-seasoning is needed, please repeat the ‘Before initial use’steps listed above. Handle the pans carefully between use. If possible, do not stack or nest the pans as this could scratch the non-stick coating. 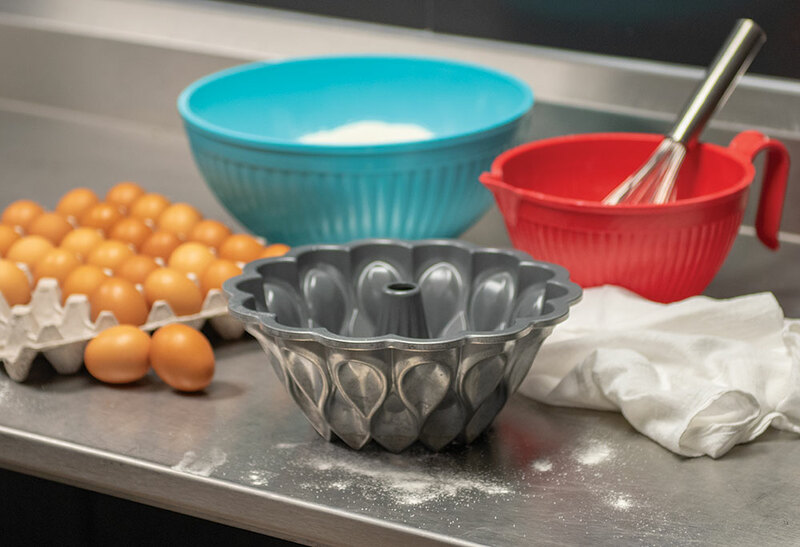 To prevent air bubbles in the cake, slowly pour the batter in one section of the pan and allow the batter to flow in and around the Bundt® design. Gently tap the filled cake pan on the counter a few times, this will make the air bubbles/pockets rise up and away from the outside of the cake. Mixes and recipes may vary, so fill the pan about ¾ full to avoid overflow. With a spatula, push the batter to the outside of the pan pushing slightly up the walls; this will help the cake climb up the sides, giving you greater detail on the outside of the cake. Place the pan on the center rack of the preheated oven. For dark colored pans, reduce the recommended oven temperature by 25°F (10°C). Bake for time indicated and cool 10 minutes –no less, no longer. With hot pads, pick up the cake pan and gently shake the pan from side to side listening for thumping. This indicates cake is loose and ready to invert. A plastic knife may be used to carefully loosen the cake around the center tube and sides if sticking persists. Invert on plate or cooling rack; continue to cool. After the cake has cooled, dust with powdered sugar using a sifter or drizzle your favorite sauce on top. ENJOY! Brush Bundt®pan with a solid vegetable shortening and dust lightly with flour. Use a pastry brush to apply the shortening. Apply it evenly and be sure to coat all of the nooks and crannies in the pan. After dusting with flour, briskly tap the pan several times with the palms of your hands to distribute the flour evenly and then turn pan upside down over a sink to remove excess flour (For awesome detail, Wondra flour works best). 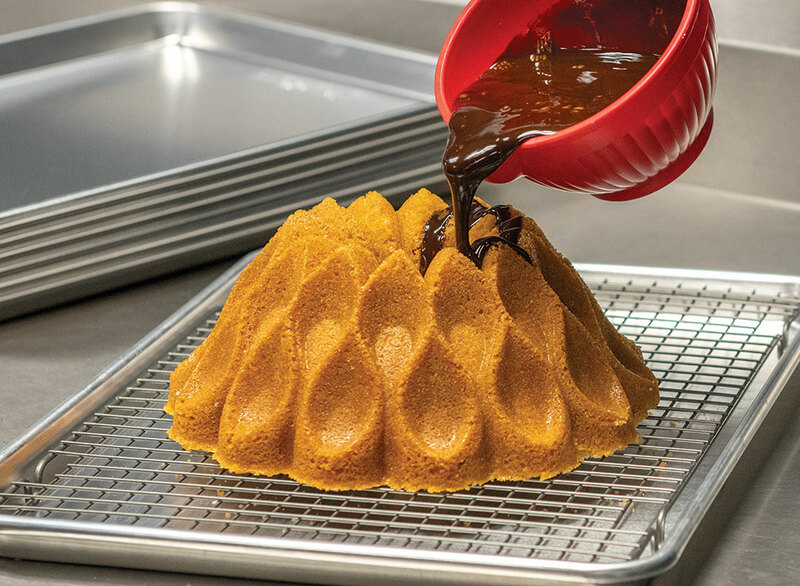 An alternate method is to spray the Bundt® pan with a non-stick vegetable oil. (We recommend a non-stick spray that contains flour, such as Bakers Joy.) After spraying, take a pastry brush and brush the oil into the nooks and crannies of the pan and then turn the pan upside down on a paper towel, allowing excess oil to drain away. Avoid using spray with lecithin listed as an ingredient as a gummy residue can build up over time.